Winding your own ball of yarn can be challenging; if you don't do it correctly it can easily become a pile of knots. Laura Zander from Jimmy Beans Wool shares her tips for winding yarn properly. Learn how to wind a center pull ball of yarn in this free knitting tutorial. You'll be transforming store-bought skeins into neat, compact balls of yarn in no time! More often than not, it's the end of the day when I decide on a project and I don't have time to wind the yarn at the store. Here is a great way to wind your yarn into a center pull ball! 1. Uncoil your hank of yarn and hang it over a dining room chair. 2. Find the end of the hank and drape it over your index finger. 3. Using the yarn from the hank, create figure-8s around your index and middle fingers. 4. Continue wrapping the yarn in figure-8s around those 2 fingers - and be careful not to cross the yarn over the original end of the hank. 5. Once you've created a good sized core of figure-8s, you can start to wind the yarn around that core. 6. Now that you've wound the entire hank around the core, tuck in the end and you've got a center pull ball! So, grab a fresh hank of yarn and give it a shot - you never know when you'll need to wind it yourself!! Tutorial is not working, the ad for the survey keeps looping and I tried to get another tutorial, and the same thing happens. I would object to the phrase, "you can wrap it fairly tight" as this will stretch your yarn and I find that if you pull any yarn tightly as you wrap it, once you have completed your project and wash it, the yarn will go back to its old unstretched shape and you will find your project sometimes a little bit smaller. You didn't shrink it in washing, it has just gone back to the original shape of the yarn. 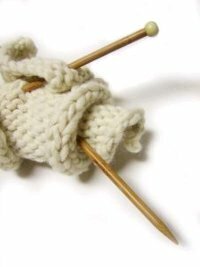 I wrap my yarn in a similar way, but start on my finger and always tell my students, "Do not pull or tighten the yarn as you wrap, but keep it loose" then explain the reason as above. What Are the Best Knitting Needles for Beginners?